The doctor is coming – whatever the weather! Home visits represent over 13 million GP consultations throughout the UK each year, and any associations with weather patterns might have implications not only for patients, but also GPs’ workload and possibly for A&E attendances and ambulance usage. Melvyn Jones and colleagues at University College London studied links between weather patterns throughout the year and the provision of acute GP home visits in an out-of-hours service provided by GPs in Hertfordshire. They found that home visits increased on cold days and fell on sunny days, but did not find an overall impact of weather on home visiting rates. They concluded that GPs working in this out-of-hours system are able to deliver care to frail housebound patients in most weather conditions – a good news story for general practice and the NHS. Within a large study to improve the targeting of antibiotics in children with respiratory tract infections, Esther van der Werf and colleagues studied symptoms reported by the parents of 8390 children, and their severity assessment, alongside those of GPs. Parents generally considered their child to be more unwell than the GPs. 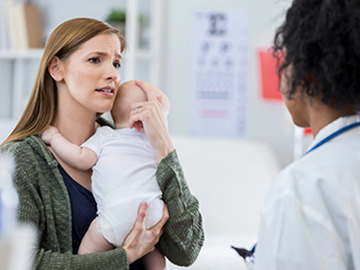 Symptoms that were important to parents, such as severe dry cough, going off food, and disturbed sleep are not related to clinicians’ severity assessment – it may be important for GPs to provide reassurance about these symptoms. High fever and rapid breathing were accurately recognised by parents as being indicative of illness severity. Doctors also considered severity to be greater in children with intercostal recession, chest signs, drowsiness or irritability, and nasal flaring. These are important findings, and not only emphasise the need for GPs to recognise that parents may reach different conclusions and use different factors when making judgements about illness severity, but also provide guidance to patients on which symptoms to be particularly concerned about. Better dementia diagnosis – at a price? A national Dementia Strategy was introduced in 2009 to encourage earlier diagnosis of dementia. This led to two voluntary financial incentive schemes in general practice to facilitate timely diagnosis and support for dementia. In an analysis of 7079 English primary care practices by Dan Liu and colleagues from the University of York and the London School of Economics, the two schemes were both associated with a positive impact on quality outcomes for dementia measured by the Quality Outcomes Framework. Researchers found that the schemes had beneficial effects on the care of other long-term conditions, but also sounded a warning note: there seemed to be some adverse outcomes on several aspects of patient experience, including reduced patient centredness, continuity of care, access to care, and confidence and trust in the GP. Practices may have diverted efforts towards assessments for dementia, reducing the time available for other patients. The General Medical Council's eighth annual report on The state of medical education and practice in the UK 2018 puts support, retention, and supply of doctors for the future at the very centre of its priorities, commenting that the UK is running out of time to prevent a significant decline in workforce numbers, which risks patient safety. The report takes a close look at the problems facing the medical workforce and the pressures on individuals working in the system. It contains a call to action in the healthcare sector for a commitment to new ways of thinking about how workforce supply can be achieved, and how workforce strategies in all four countries of the UK need to set out clear plans for ‘making the UK a great place to work for doctors’. The idea of a call for action is taken up in an Editorial by Sanju George and Clare Gerada who trace the implications of this report for general practice. In an analysis of over 800 patients diagnosed with laryngeal cancer, Shephard and colleagues from the University of Exeter found that symptom combinations may have a higher predictive value for a cancer diagnosis than single symptoms alone. The predictive value of persistent sore throat plus either dysphagia, dyspnoea, or otalgia is greater than 5%, compared with the predictive value for hoarseness alone of 2.7%. 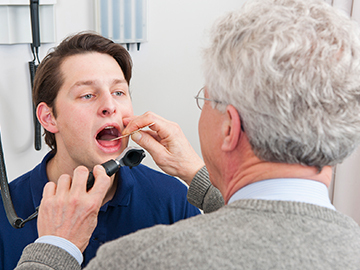 Patients with hoarseness and abnormal inflammatory markers on blood testing have a particularly high (15%) likelihood of cancer.